Diffusing essential oils in your home can provide an ambiance that candles, plug-in air fresheners, and sprays just can’t do. Using different oils can also improve the overall health and well-being of those in the home. 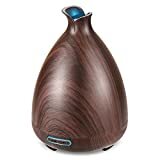 When choosing a diffuser for use with essential oils, it can be beneficial to read information on the size of the diffuser as some are designed for use in small rooms while others may work in large open spaces. There are many different essential oil diffusers on the market so it may take a bit of research to find the best option for your home. Diffusers that are designed for use with essential oils come in many different shapes and styles. You should easily be able to find an option that coordinates with the decor of your home. Many diffusers also come with tips and ideas on how to use different essential oils to get the effect you’re looking for in your home. This can be especially helpful for those who are new to the use of essential oils. The following is a list of the top 10 best essential oil diffusers. 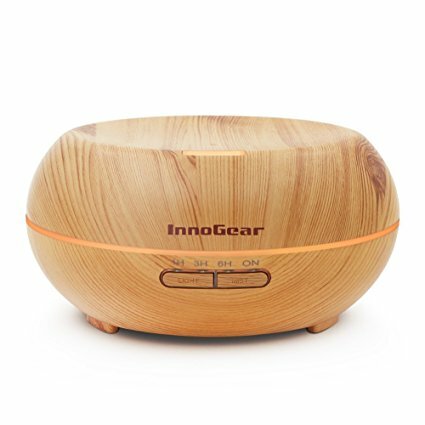 The InnoGear Aromotherapy Essential Oil Diffuser has a wood grain look but is made of durable plastic materials. This diffuser has seven different colors of LED lights that allow you to adjust them based on the mood you want in the room. The water tank in the unit can hold up to 200 mL of water making it ideal for many different sized spaces. This diffuser has a timer setting that allows you to set the unit to turn off automatically. It also has an automatic shutoff for safety. The controls are easy to use and you can switch between heavy misting or light misting depending on your diffusing needs. 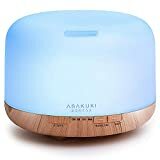 The ASAKUKI Premium Essential Oil Diffuser has a larg 500 mL water capacity. This unit is ideal for use in larger rooms as it is able to put out more mist that some other smaller units. The diffuser has 7 colors for the LED lights so that you can customize the look and feel you want in your home. This diffuser has a safety auto-off switch to prevent the unit from overheating in case it runs out of water. It’s equipped with multiple mist nebulizers that are able to spread the scent of the oil, as well as the moisture, throughout the room. The unit has simple controls and allows you to switch between 2 different misting levels. 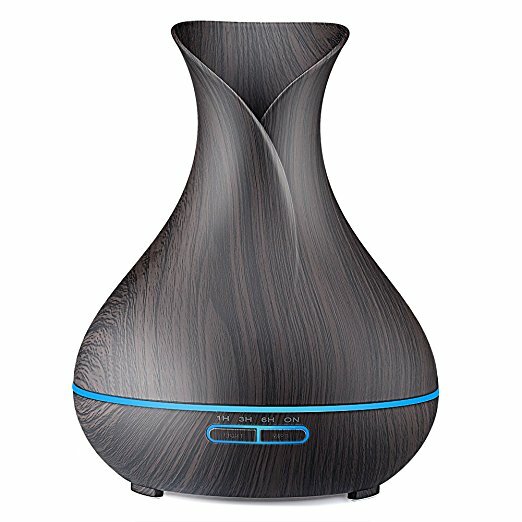 The URPOWER essential oil diffuser has a stylish look that can fit in with any decor. 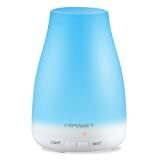 This diffuser has ultrasonic technology to provide you with cool mist throughout the entire room. It also has an automatic shutoff feature for safety. The diffuser has a natural wood grain look in a shape that is designed to look like a vase. This diffuser is able to work quietly and efficiently to spread the humidity and the scent of your essential oils. It has a 40 mL capacity and can work for around 6-12 hours depending on the level of diffusing you’re using. The unit has a timer and LED lights to create an ambiance in your home. 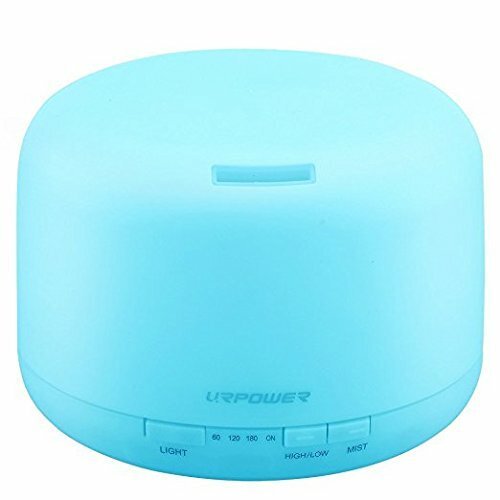 The URPOWER Aromatherapy essential oil diffuser has a 500 mL water capacity. It comes with a shutoff feature that automatically turns the unit off if it runs out of water. This helps to prevent overheating. 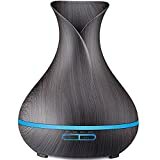 This diffuser has a stylish colorful look that could easily coordinate with the colors of your bedroom, family room, or other space in your home. This diffuser from URPOWER has 7 colors of LED lights. The unit comes with simple controls that allow you to change the light colors and change the level of misting depending on the size of room you’re in as well as the effect you’re looking for. The URPOWER diffuser is a compact unit that would work well in a bathroom, small bedroom, or other small space. The unit has a capacity of 130 mL. It has a stylish look that is made of plastic designed to look like wood grain. The LED lights, which come in 7 colors, add to the ambiance of your room. This diffuser from URPOWER has an adjustable mist level so you can easily change the settings based on your needs. The unit acts as a humidifier as well as a diffuser to add moisture to the air, creating a healthier environment in your home. This can be especially beneficial when you have sick people in the house. 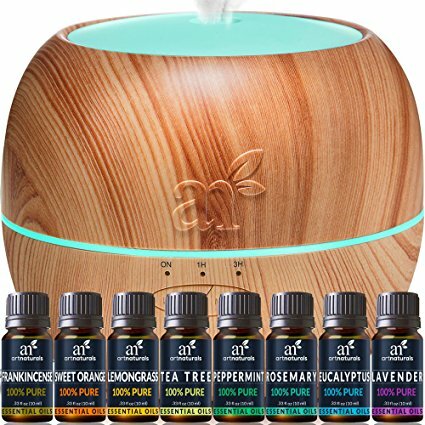 The ArtNaturals Essential Oil Diffuser and Gift Set is ideal for those looking to learn about using essential oils in their home. This set comes with the diffuser and 8 of the most popular oils that people use frequently. The included oils are: frankincense, sweet orange, lemongrass, tea tree, peppermint, rosemary, eucalyptus and lavender. This diffuser is silent but still powerful enough to spread the scent throughout the room. It can be used in rooms of all sizes. The no-heat ultrasonic technology delivers humidity and scent throughout your home in a smoke-free way. 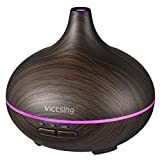 The VicTsing Mini Aroma Essential Oil Diffuser has a 150 mL water tank that is ideal for use in small rooms. This diffuser is compact and can easily fit in a small space. It has a stylish dark brown color that has the look of wood grain but in a durable material. 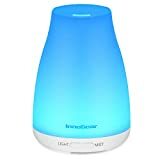 This essential oil diffuser also acts as a cool mist humidifier. The unit has 14 LED lights that are in 7 different colors. You can change the colors of the lights depending on the mood you want for the space. The unit automatically turns off when it runs out of water to prevent overheating. The Aromatherapy Essential Oil Diffuser set comes with 2 diffusers so you have options when placing the diffusers around your home. They both have an automatic shutoff that turns the unit off when the water runs out. The diffusers have LED lights that can easily change the color of the unit so that they can change the mood in your space. 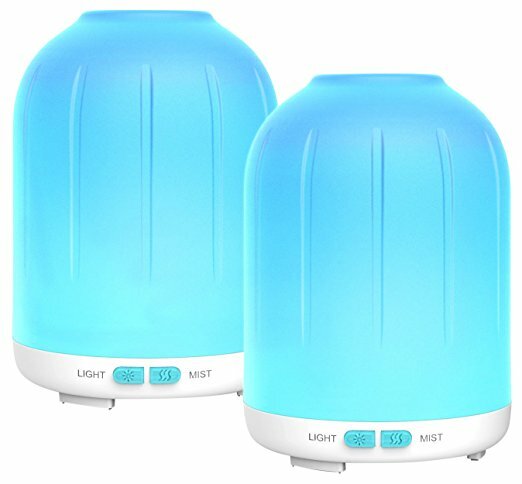 These essential oil diffusers have bright and dim modes so you can use them any time of day. The ultrasonic technology in these diffusers can emit cool humidity in the air, which helps improve the air in your home and can also be beneficial for certain illnesses. 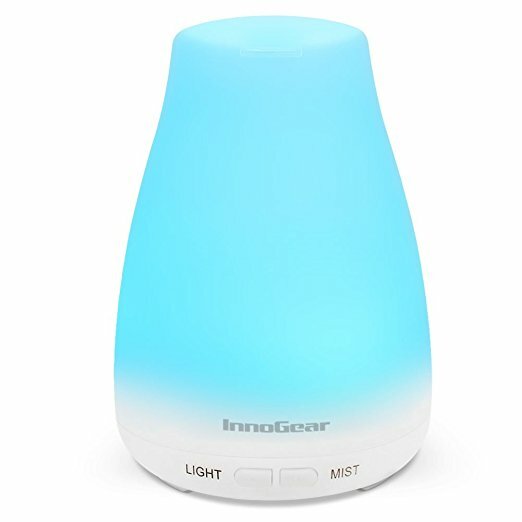 The InnoGear Upgraded essential oil diffuser has a water capacity of 150 mL. The unit is small and works well in small spaces as it doesn’t take much space on your counter or dresser. The unit has a whisper-quiet operation that allows you to use the diffuser without disrupting the mood in your home. 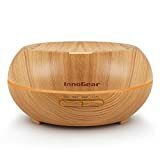 This diffuser from InnoGear works well to add humidity to the air which can help with stuffy noses due to allergies, colds, or other issues. The diffuser can be especially beneficial during the winter months as it helps to prevent dry or chapped skin in cold weather. 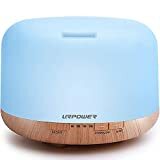 The URPOWER 2nd Version Essential Oil Diffuser has been improved from the former version to provide more mist that can go throughout the room. This diffuser can add moist air to the space for a more comfortable environment in your home. This unit is small and can be used in a bedroom, bathroom, or other small space in your home. 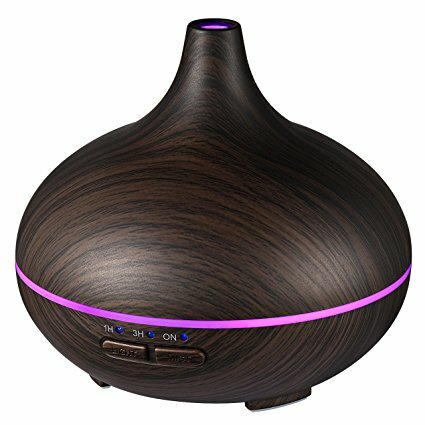 This diffuser is designed to be used with 100% pure essential oils for the maximum benefit. It has LED lights that can change to 7 different colors. You can program the unit to turn on or off when you need it to. It also has an automatic off feature to prevent overheating if the water runs out. If you don’t know much about essential oils, you can still get the benefits of diffusing them in your home. There are many blogs and websites dedicated to the use of essential oils and the benefits of using different oils. Some are used for relaxation while others can help promote an overall feeling of wellness if you have sick people in the house. Choosing a quality diffuser can help ensure that you’re able to get the maximum benefit from the oils you choose. Some diffusers may come with sample oils so that you can see the benefits before you choose to invest in oils of your own. 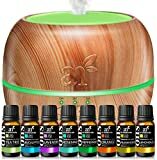 When you’re shopping for an essential oil diffuser to use in your house, you may feel overwhelmed at the different choices. They come in many shapes and designs so that you can easily find one that doesn’t distract from your home decor. It can be helpful to read online reviews from other consumers to find a diffuser that works well at getting the scent throughout the room, or throughout the entire home. These reviews can provide you with objective information on the capabilities of the diffusers you’re considering, as well as how easy they are to clean when you want to change out the oil you’re using. Some recommended products may use affiliate links. DeWhiteHome.com is a participant in the Amazon Services LLC Associates Program, an affiliate advertising program designed to provide a means for sites to earn advertising fees by advertising and linking to Amazon.com. Amazon and the Amazon logo are trademarks of Amazon.com, Inc or its affiliates. Copyright © 2017 DeWhiteHome | All Rights Reserved.